Phillies GM Matt Klentak says J.T. Realmuto improves club "considerably"
In an offseason still full of question marks, you have to appreciate the work general manager Matt Klentak has done to improve the Phillies in what's shaping up to be an extremely competitive NL East division. On Thursday the Phillies acquired All-Star catcher J.T. Realmuto from the Miami Marlins in exchange for top pitching prospect Sixto Sanchez, catcher Jorge Alfaro, left-handed prospect Will Stewart and an undisclosed sum of international bonus money. Realmuto, 27, remains under team control for two more seasons and is coming off a spectacular 2018 where he posted a career-high 111 OPS+ to go along with a .277 average and 17 home runs. Sanchez is highly touted, ranked as the No. 13 prospect in the game by Baseball America, but Klentak and Co. felt the risk of trading a potential top of the rotation arm was worth acquiring a stud contributor who can help the Phillies win now. “It’s hard to acquire top players at any position, especially catcher,” Klentak said. “When you’re at the early stages of a rebuild, one of the hardest things is to close your eyes and visualize what that roster is going to look like when you get back to the playoffs. It’s hard. You don’t know. You trust that your process is sound. You trust in your player-development group. You trust in your scouts." The Phillies had Realmuto on their radar since October. The two clubs communicated a bit, but things fizzled out around Holidays. Klentak said the conversation reignited on Saturday after he sent "an innocent" text to Marlins president of baseball operations Mike Hill. The move to Philadelphia should enable Realmuto to put up even better offensive numbers. On the road his OPS last season was .870, compared to .773 at home in an unfriendly Marlins Park. He's also bringing a fantastic glove to the Phillies as an outstanding defender and game caller behind the plate. "I anticipate our entire rotation taking a step forward with Realmuto behind the plate," Klentak said. "He's that good back there." 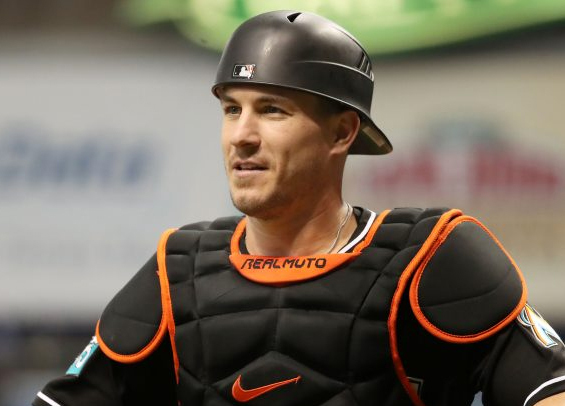 Realmuto joins Jean Segura, David Robertson, and Andrew McCutchen as marquee offseason moves aimed at improving the Phillies in 2019. There's also the potential of landing another big-time bat in Bryce Harper or Manny Machado, and the Phillies believe their efforts to put a winning club on the field could sway some favor. “This is another acquisition that demonstrates our commitment to winning and I hope that demonstration would be appealing to free agents,” Klentak said.